Come join us for a great chili dinner and the sweet sounds of harmony. Doors open at 6pm at Gobin Memorial United Methodist Church with a chili dinner with fixings for taco salads, drinks, and homemade desserts with the show beginning at 7:00pm. Tickets are $10 for Adults and $5 for Children 12 and under. Performing will be Covered Bridge Harmony, several quartets and ensembles, Change of Heart Quartet, and the High School Senior Boys' Quartet. 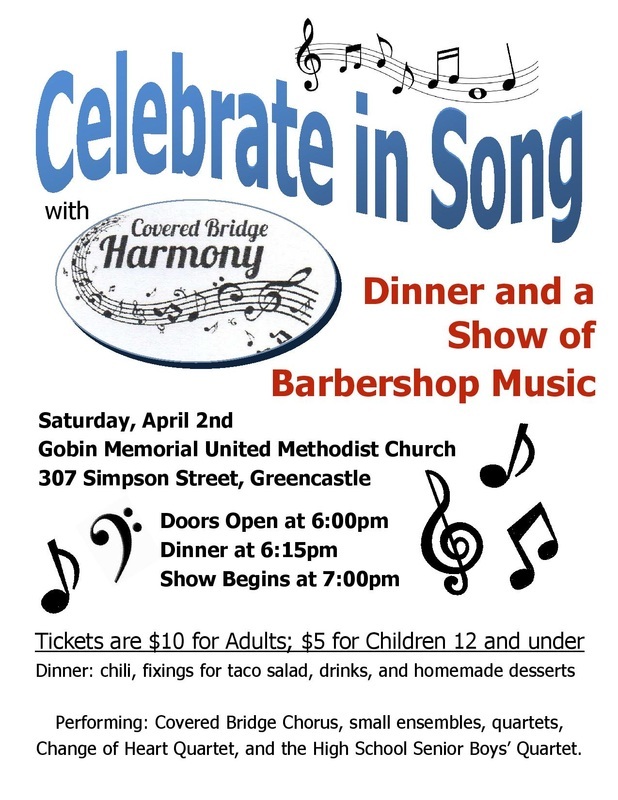 Enjoy a memorable night of food, fun, and a cappella barbershop music sponsored by Covered Bridge Harmony of Harmony, Inc.